Indeed, it will be endless to list the way He cares for us. Also, we want to thank you for your faithful prayers and support. Yes, it is God who does all the work, but He also uses His people so they may have opportunity to serve and to testify for Him. We may not recognize all your prayer and various support, but our Lord will remember your testimony and will bless and reward you in diverse ways. Please continue to participate in our ministry as you have. It is always amazing to hear how God has called each one in different ways. Especially, BCEA students all have diverse testimonies of how God had brought them to the college. Some came to Nairobi for another school and ended up at BCEA. Some just passed by and decided to study after they talked with the watchman. Some quit their well-paid jobs, others gave up their belongings, and still others left their country, etc. Many have sacrificed their possessions and positions and are struggling with family matters and finances; a number are still despised by family members and friends. However, they are on the track as Paul said in Philippians 3:14, “I press toward the mark for the prize of the high calling of God in Christ Jesus.” We are happy and thankful to testify of the high calling of God in Christ Jesus for individuals. Indeed, struggles may remain on the earth, but great testimonies abide in heaven. We pray the Lord may continually bless the ministry of the Bible College so that we may see the extension of His kingdom. Also, we want to encourage you to continue to pray for His high calling in the land of Africa. There were many events in the first half of 2013, but we want to share one which gave us some encourage- ment. In April, Eben had a special journey to Mwanza, Tanzania; he was with James (a BCEA lecturer from the Bible Presbyterian Church in Singapore) and Rev. Judah Pallangyo (Academic Dean of BCEA Tanzania). 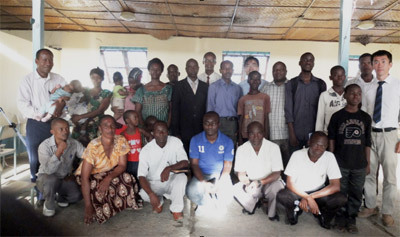 There was a small denomination called the “Reformed Churches of Tanzania” in Mwanza. This church has sent seven students to BCEA Tanzania; three already finished their studies. They had invited some BCEA lecturers for a seminar. It was actually a very long journey. James and Eben traveled from Nairobi more than 2,000 km in six days – a total of 33 hours in three days on the road. This may not appeal to you too much since you have never seen some of the rough roads here; it was very tough. The modified coach gave a very tiny space for the passengers, flying over humps at 90 km/h. We were exhausted when the bus finally stopped after almost 12 hours on the first day (the bus only stopped for 15 minute breaks). However, it was a wonderful and fruitful journey. Actually, in Kenya and Tanzania, it is not very common to find reformed churches, so it was exciting for us to observe the doctrine and practices of the church in Mwanza. Also, hearing the testimony of the church in which God has raised up various young men to begin churches with the reformed faith has encouraged us to continue our labor for the Bible college movement. Although the seminar was not very long, the time was enough to have fellowship with brethren whom we had never met before (see photo above). In fact, two young leaders who had well-paid jobs decided to study at BCEA Kenya; one will arrive next January. There were some long-term plans made with this church: building projects, seminars, and training programs. Therefore, do pray for the project in Mwanza, Tanzania. On December 1, 2012, the college had its 42nd graduation service. There were 40 graduates: 5 B. Min, 22 Advanced Diploma, 7 Diploma, and 6 Certificate. Do pray for the graduates as they serve the Lord in various parts of Africa. A good number of students joined the college in the 1st and 2nd term. We have 27 1st year students right now. There were more than 30 students in the beginning, however, some have quit due to various excuses. Pray for the students who have remained and those who have left; they must realize the high calling requires commitment. Eben has taught various subjects such as Music, Through the Bible, Cults, and Roman Catholicism. Pray for wisdom as he continues his teaching on Music, Through the Bible, Tabernacle, Inter-testamental History, Homiletic Practice, and the Book of Revelation next term. The College is planning to have an “Alumni Conference” in August. We are expecting 300 alumni. Pray for a safe journey of the graduates and for a successful and fruitful meeting. Do pray for wisdom and for unity for teachers and students. Praise the Lord for He has sent a good number of kindergarteners this year; the number is almost 90 this year. Pray for wisdom for all the teachers and for Mijung in the management of the Kindergarten. Eben has worked with the project in the Kiluani Masai Mission Station, especially in the construction of the primary school building. Thank God for the completion of the building and His protection on the road. Continually pray for safety on the road as Eben travels. Also pray for the unity, honesty, and development of the primary school ministry. Do pray for the establishment of the Bible College in Rwanda. Thank God because many things have been done by His grace; however, much more is required. Also, pray for brother Joshua who worked at BCEA until June, and now serves in Rwanda. Pray for wisdom and safety for him. Eben was given an opportunity to participate in the graduation of the Bible College of East Africa, Tanzania. There were 11 graduates on 25th May. Some of them will join the campus in Nairobi in order to continue their studies. Pray for the graduates as they go out to serve faithfully. Also, pray for new students for the 2nd term of 2013; they opened on 15th July. Eben and Mijung are doing well in the Lord. Especially, in her last check-up, the doctor gave Mijung a good report. He-eun is in her 4th year in the primary school. For her, do pray for wisdom. Ha-jin is entering 1st year in the primary school. He has spent all his life with Kenyans; he is having a new experience in the international school. Pray as he adjusts to the new school and friends. Ha-hyun is always doing well. He is in the 1st stage of kindergarten, equivalent to K4 in US. Pray for his adapting and acceptance as he shares his life with others kindergarteners. There is lack of medical technologies; many diseases are more curable in the developed countries. There are some traditional cults which teach wrong practices and beliefs about life after death. In fact, some came and disturbed the funeral services the other day. Always, a testimony remains; in every meeting, people talk about the faithful life of the person who died. We want you to notice the last one. What kind of testimony do you have right now? As the Yoon family enters into their 9th year in Kenya, we have examined the testimony we have. We are wondering how the locals will remember us when we depart from the nation or from the earth perhaps. We are praying that the Lord may strengthen us so that we may remain faithful servants on the mission field. Do join and continue with us in this ministry with prayer and support; you are participating in the work of God in your home land. Definitely, your testimony will remain and be remembered before the Lord and before the people. May the Lord bless and keep us as we serve the Lord in these last days.